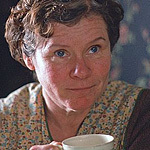 Filmmaker Mike Leigh (Secrets and Lies, All or Nothing), working with actress Imelda Staunton (getting some early Oscar buzz for her portrayal), creates another soul-deep portrait of a working-class British woman. How about a nice coop a tea? Set in 1950 and shot in a rich, brothy light that could nourish you for days, Vera Drake is a story about a witch. Vera is not literally a witch. But in the sense that witches were herbalists who practiced folk medicine and were misunderstood and marginalized by a patriarchal society — Vera fits the bill. Vera is a steadfast, decent woman. She’s a perfect mother, a sunny optimist, and pragmatic enough to sew all her own clothes. If there is an archetype of a kind, British matron whose catchphrase is “what you need is a nice coop a’ tea,” Vera is it. And in her spare time, she looks after aging neighbors who have no one to take care of them. Her little family consists of her husband George (Richard Graham), who works for his younger brother in an auto repair shop, her dandy son who works as a tailor, and her introverted daughter Ethel (Alex Kelly) who spends so much time looking at her feet she’s growing a hunch. Her sister-in-law is not happy being lower class, and she needles her husband — George’s brother — to better their lot, using their distance from the Drakes as a measure of how far they’ve come. Their neighbor Reg (Eddie Marsan) is a lonely bachelor, a nice man for “our Ethel,” thinks Vera. She starts matchmaking by inviting Reg over to dinner. But she has another side that she keeps from her family. She also “helps young girls” who find themselves in a family way. She doesn’t use coat hangers, but a relatively sterile douche of soap, water, and some sort of mineral oil or disinfectant. If you’ve seen the trailer, you know that, first, a medical doctor becomes involved, and then the police, and then the courts. Vera Drake only half benefits from this strength of Leigh’s. The first half of the movie is another mesmerizing Leigh portrait, not only of Vera but of her little family. But the movie falters when one of Vera’s patients gets sick, and the M.D.s and police get involved. Leigh stops focusing so tightly on Vera’s portrait, and plot developments take over. He jumps around in time, compressing the months-long legal proceedings into the last third of the movie. His concentration is broken. We still care about the characters, but the captivating, magnetic spell has been broken, and Vera Drake becomes just another well-made British drama. Some pro-life groups have already rallied around Vera Drake as a film in support of their cause. And I won’t even say that, as audiences, they are misreading the movie. But I also don’t think that the movie chooses sides. The movie shows a picture of an abortion provider, and you can react however you will. Whatever your political beliefs, you will not feel like you are being preached at. In fact, if you’ve read much behavioral genetics, you might even make the case that Vera is as cunning and cruel as a cuckoo bird. Here’s a woman who, while removing the offspring of other women, is arranging a match for her daughter and whose sister-in-law (no genetic relation, but still...) becomes pregnant. I seriously doubt this interpretation crossed Leigh’s mind, but it illustrates that his story is too complex to be summed up on a bumper sticker. Vera Drake isn’t one of Mike Leigh’s masterpieces, but it’s still a very good drama. Staunton’s performance is impeccable. The cinematography is so rich you can almost feel it. The only reason not to see this movie is if your local pro-choice group (or pro-life group) invites you to see it as part of a political activity.